House of Trump, House of Putin offers the first comprehensive investigation into the decades-long relationship among Donald Trump, Vladimir Putin, and the Russian Mafia that ultimately helped win Trump the White House. It is a chilling story that begins in the 1970s, when Trump made his first splash in the booming, money-drenched world of New York real estate, and ends with Trump’s inauguration as president of the United States. That moment was the culmination of Vladimir Putin’s long mission to undermine Western democracy, a mission that he and his hand-selected group of oligarchs and Mafia kingpins had ensnared Trump in, starting more than twenty years ago with the massive bailout of a string of sensational Trump hotel and casino failures in Atlantic City. This book confirms the most incredible American paranoias about Russian malevolence. To most, it will be a hair-raising revelation that the Cold War did not end in 1991—that it merely evolved, with Trump’s apartments offering the perfect vehicle for billions of dollars to leave the collapsing Soviet Union. 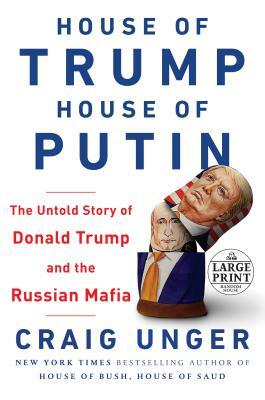 In House of Trump, House of Putin, Craig Unger methodically traces the deep-rooted alliance between the highest echelons of American political operatives and the biggest players in the frightening underworld of the Russian Mafia. He traces Donald Trump’s sordid ascent from foundering real estate tycoon to leader of the free world. He traces Russia’s phoenixlike rise from the ashes of the post–Cold War Soviet Union as well as its ceaseless covert efforts to retaliate against the West and reclaim its status as a global superpower. Without Trump, Russia would have lacked a key component in its attempts to return to imperial greatness. Without Russia, Trump would not be president. This essential book is crucial to understanding the real powers at play in the shadows of today’s world. The appearance of key figures in this book—Paul Manafort, Michael Cohen, and Felix Sater to name a few—ring with haunting significance as Robert Mueller’s investigation wraps up and others continue to close in on the truth. Craig Unger is the author of the New York Times bestselling House of Bush, House of Saud. The former deputy editor of The New York Observer and editor-in-chief of Boston Magazine, he has contributed to Vanity Fair, New York Magazine, Esquire, The New Yorker and many other publications, and has appeared as an analyst on MSNBC, CNN, the ABC Radio Network, and other broadcast outlets. Unger has written about the Trump Russia scandal for The New Republic and Vanity Fair. He is a graduate of Harvard University and lives in New York City.